The New Year has come! A time to set goals and reflect on past years. 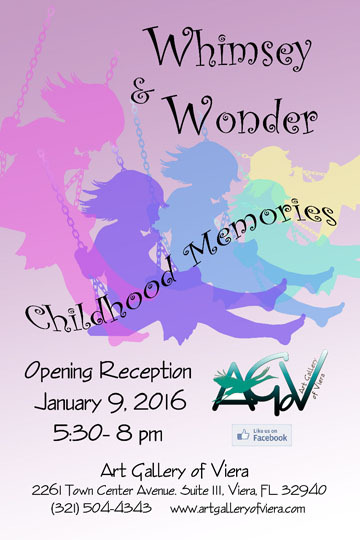 Join the artists of Art Gallery of Vioera on a trip down memory lane for their "Whimsy and Wonder" show featuring fantastical imagery and childhood memories. The opening reception on Saturday January 9th gives the unique pleasure of getting to talk with each artist about their work (and enjoying some light refreshments as an added bonus) In addition, you can also enter to win a piece of art by Tricia Eisen and check out a fantastic demo by Jaymee Weinreich. The event is free and family friendly, we hope to see you there.